I have a grown son James who lives in Pittsburgh. He moved there a year-and-a-half ago, and I still miss him a lot. He comes back to visit frequently because he still has a lot of friends here in south central Pennsylvania, so I do get to see him frequently. And we talk on the phone several times a week, sometimes several times a day. My son and I both like traditional music and just about anything Irish. That includes Irish sweaters. I’m a lucky lady. My son wears sweaters, and he loves the handknit variety. My husband rarely wears sweaters. The Aran sweater I made for him? He wears it once a year or so just to humor me. He likes it, and it fits him well, but he just doesn’t wear sweaters. But James does. The first sweater I made for James was actually originally made for me. It’s Beth Brown Reinsel’s White Gansey that I made out of dark gold Dale Heilo. Yep. That’s it in the picture at the beginning of this entry. Several years ago, my husband and James were preparing to go to a football game on a bitterly cold November day. I was afraid James would freeze, so I got out my gansey and told him he could wear it if he wished. It’s made from the nice, warm Norwegian wool that keeps the sheep of Norway warm in the winter. So I figured it would keep a young man warm at a football game. Since the passing of the gold gansey, I have made two more sweaters for my son, both of them serviceable but boring stocking stitch top-down raglan pullovers. 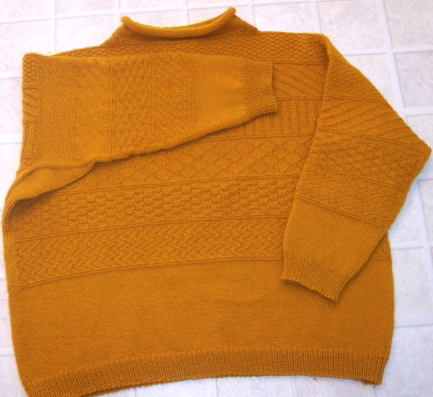 I long to knit something fancier, but James’s taste tends toward plain and simple. B-O-R-I-N-G! But, lo and behold, I found two interesting patterns that he likes. One is a gansey from Sabine Domnick’s book, Cables, Diamonds, Herringbones: Secrets of Knitting Traditional Fishermen’s Sweaters. We haven’t settled on a color for that one yet, The other is the Amhra’n Gra’ (Love Song) Aran pullover that I got from Knit Picks. It is no longer available on their web site. He wants the Aran first, and we settled on Kelly green, Knit Picks Wool of the Andes in Grass. I told you he loves nearly anything Irish.